SyntecOptics.com is a one stop shop for all your needs regarding intricate optical and optomechanical components used in eye surgery equipment. We machine complex geometries with high precision to match your specifications. One of the most established uses of femtosecond lasers for tissue modification is LASIK (Laser-Assisted In Situ Keratomileusis). The precision and minimal damage achievable with femtosecond pulses is ideal for cutting the delicate transparent cornea of the eye. Even though the femtosecond LASIK procedure has been practiced for over a decade, improved laser processes are still being developed, such as all-femtosecond LASIK without the need of an excimer laser. In addition, new types of vision correction are gaining acceptance. A well-known example is cataract surgery, where the diseased lens can be broken up using a femtosecond laser. Another possibility is reducing presbyopia, the stiffening of the lens with age that prevents the eye from focusing on near objects. A network of fine laser cuts in the lens can restore flexibility, so the lens can change shape to focus on near objects. With a long history of providing top quality and delivery of intricate parts, Wordingham Technologies was contacted by a client to make an eye surgery component. There were several challenges in custom manufacturing this part. 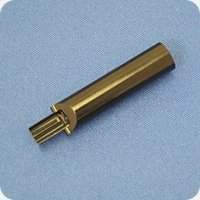 The thru bore and counter bore are tolerenced at +/- .0001 after a nickel plate finish. The .031 dowel holes have a true position tolerance of .001 and these are done in a second operation. The part geometry also makes deburring difficult.